Our country India is a land of multiple religions and festivals to cherish! Since Islamic religion is an integral part of our culture, thus the festivals of Islamic people are of great importance in the country and are celebrated with equal fervor as that of Hindu festivals. As Islam preaches brotherhood, love and peace and asks it’s flowers to spread them all over. 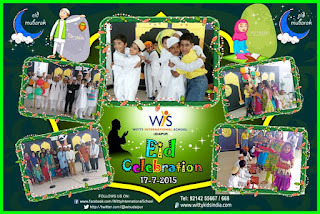 Keeping this in mind Wittians celebrated the joyous festival of Eid-Ul-Fitr by organising a special assembly. Young wittians of Grade II B spoke about the fervor and importance of the festival. Assembly commenced with the recitation of a beautiful poem. Students then enacted a famous play ‘Hamid Ka Chimta’ written by the well- known writer Munshi Premchand. The finishing touch to the programme was a melodious song presented by the WIS choir. Their soulful singing filled the atmosphere with peace and spirituality.